Global visibility map of Comet ISON, which is a potential "comet of the century". 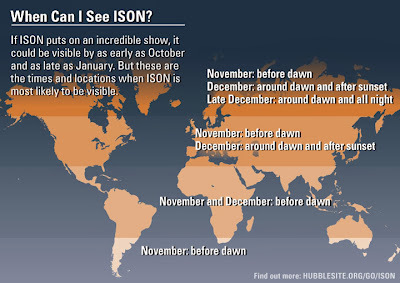 If ISON puts on an incredible show, it could be visible by as early as October and as late as January. But these are the times and location when ISON is most likely to be visible. Geographic regions of China with elevation.